The weather for the umpteenth running (no one is really sure of the exact number) of the Walt Elliott Challenge couldn't have been better. Starting off with a nice steady 8 to 9 knot breeze from the South and building to 16s and 17s from the South West as the day progressed. making for a great series of windward leeward races. 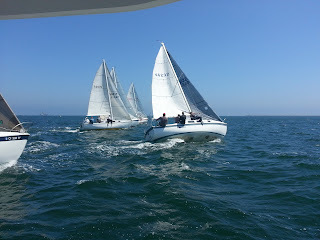 This years Defending club, Long Beach YC, accepted Huntington Harbor YC's challenge in Cal 25. Five of the ASPBYC member clubs were represented today. Cabrillo Beach YC's Calamazoo skippered by CBYC'S V.C. 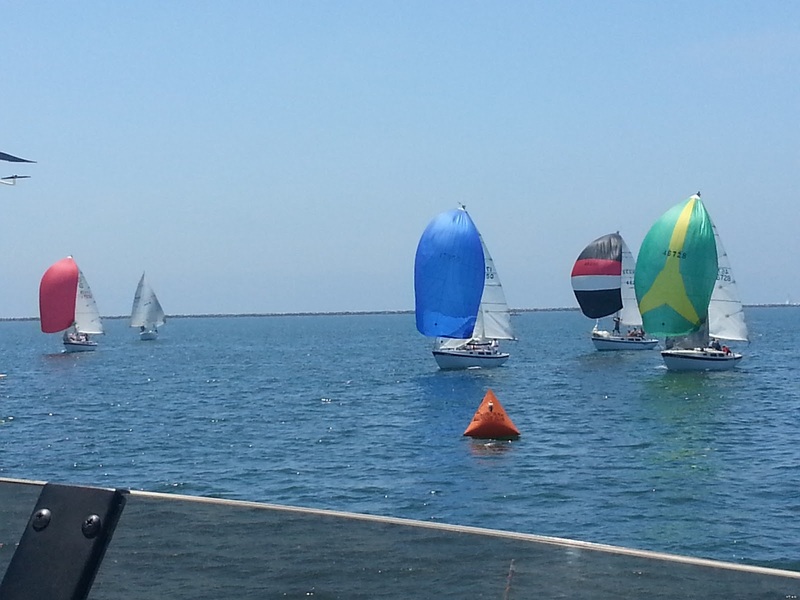 Scott Holcomb, Alamitos Bay's lquana skippered by Dennis Diem. Seal Beach's Tiberon helmed by owner Rick Sotile, Huntington Harbor's entry Discovery captained by Jeff Silver and, of course, the defending Club Long Beach YC's entry was One Time driven by Art Melendes. The first race of the day saw a cautious start by all boats. No need for an over early flag on today's two-lap opener. Calamazoo was leading at the first leeward mark rounding, but it would be Huntington Harbor's Discovery that came from the back of the pack to take the gun in the first race. 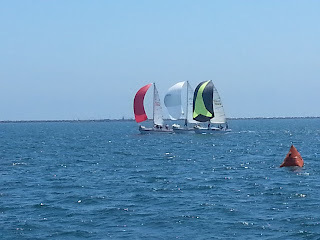 Calamazoo still leading with One Time close on thier stern. 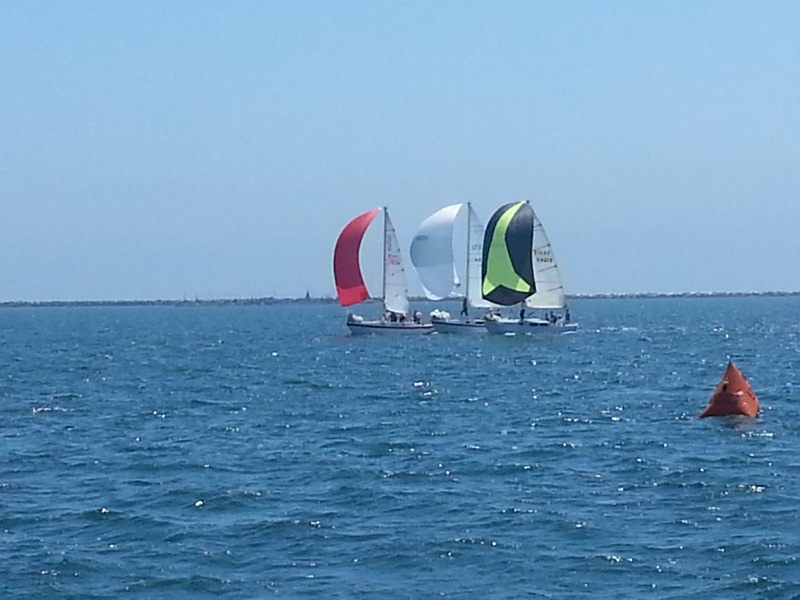 These two now having a 10 to 12 boat lead on the rest of the Fleet going into the third lap. After a great battle of the gybes on the last down wind leg, it was Calamazoo getting the checkered flag, One Time in a close-as-hell second. The fun wasn't over. The race committee was treated to a very exciting fight for third, see the picture of Iguana, Discovery and Tiberon neck and neck and neck, fighting for a third place finish. of One Time. He got out front early and never looked back, leading the pack on every lap and finishing a whopping 94 seconds ahead of second place Calamazoo. Beth lves, Michael Stuart and Grease Monkey Bob Curley for running a flawless event. Special thanks to CBYC Vice Commodorable Kristy Holcomb for doing the photographer duties.